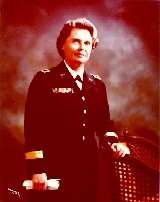 Beginning her nursing career in the Army in 1942 as a 2nd Lieutenant, Lillian Dunlap retired in 1975 as a Brigadier General. Among her war time assignments, she served at the 59th Station Hospital, New Guinea, Admiralty Islands and Philippine Islands from 1943-1945. These were some of the 'hot spots' during World War II. Other overseas assignments were in Germany in 1954-57. And as Chief Nurse in Okinawa 1965-66. In 1971, General Dunlap was selected as Chief of the Army Nurse Corps, Office of the Surgeon General. She was the second woman to serve as a Brigadier General in the Army Nurse Corps. The legendary General William Westmoreland pinned on her stars. She is recognized as a clinician, administrator and educator. Her military awards include the Distinguished Service Medal, the Meritorious Service Medal, and the Army Commendation Medal with oak leaf cluster. Since retirement in 1975, General Dunlap has been anything but idle. She is a member of numerous organizations, including President of the Army Medical Department Museum Foundation; Treasurer (Governor appointment) of the Texas National Guard Armory Board; She also serves the Army Retirement Residence Foundation; San Antonio Women's Celebration, Hall of Fame; and is an advisor for the Retired Army Nurse Corps Association, Nursing Advisory Council, and Habitat for Humanity. General Dunlap's activities include the Executive Women in Government, Washington, DC; Chairman, Federal Nursing Council; Chairman, Nursing Section, Association of Military Surgeons of the United States; Texas Governor's Commission for Women; Advisor, Texas Hospital Association Education and Research Foundation; American Association of University Women; Advisory Board, Adolescent Pregnancy Prevention Program; President Phi Lambda Chi Nursing Sorority. She has served on the Boards of a bank, an insurance company and a university. These are only the highlights of a busy retirement. General Dunlap has been recognized numerous times for her contributions. She is an "Admiral, in the Texas Navy; Honorary Doctor of Science Degree; Inducted into Texas Women's Hall of Fame (Public Service); BG Lillian Dunlap Excellence in Nursing Award, established by Brooke Army Medical Center; Honorary Fellow American Academy of Nursing; H.E.R.O. Award by San Antonio Visiting Nurses Association. In addition, she has had a river barge ("The General Lil") in San Antonio, named for her. She works tirelessly to make her community a better place to live. Women's International Center is honored to present the 1998 Living Legacy Award to Brigadier General Lillian Dunlap. She is a military trailblazer and continues her humanitarian mission.